is the recent work of Sarah McBeath at the out-of-the-way gallery above The French Art Shop in Ponsonby Rd. This is an unheralded but very impressive show. The basis of most of the paintings is a swelling hill with a sombre light in the sky beyond. Added to this archetypal New Zealand image are two other forms, a jester and a maze shape. The outstanding paintings are two called Mabers Farm. Both have spectacular skies, and in one of them the curious maze symbol appears and adds a note of song to the scene. The symbol is stretched vertically in Muriwai and disturbs the level of the horizon. This and the heavily angled Waimauku 6 are forced and mannered; but the exhibition as a whole is very powerful with the joker figures breaking through the prevailing sombreness." "The Central King Country Art Awards are generous and the competition has grown from 250 entries in 1987 to well over 500 this year. must be stimulating to culture in the centre of the island." "The most memorable and powerful painting of the two dozen on exhibition is Mabers Farm by Sarah McBeath. In this sombre work the land heaves itself up like a gutstruck whale, the water streaming off its flanks and evaporating into a luminous sky." are seen through shifting veils of paint. The Kaipara River has become a braided knot impossible to untangle. In one, Journey, the cord departs from and returns to the same pot in an elegant reference to a life briefly assumed by clay before returning to dust. In Helensville II the colour drifts and snakes through in a lazy meandering will-o-the-wisp of ochre, blood and cerulean spiking the moulded green hills with a fire of animation. As well as a flickering dance, McBeath is interested in rich, impasto effects created by using layers of card, paper and lumpy paint on hessian, canvas and board." "McBeath is trying to find her voice, beyond imitation of nature or nemesis. Taurapa is McBeaths version of the traditional sternpost of a carved canoe. It shows man in the middle place between wood pigeon above and the lizard below. These are to define his relationship with God, life and death, says the artist. They are big bold statements. 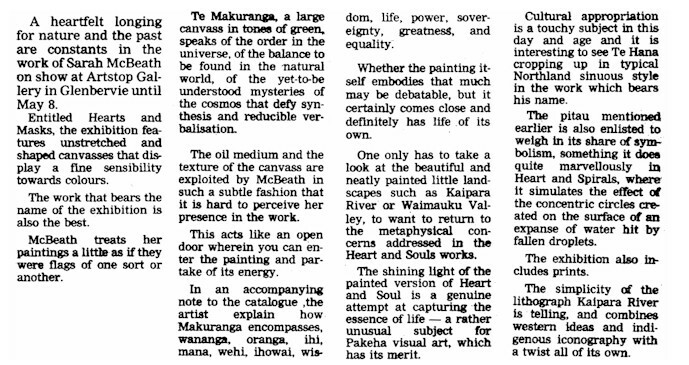 Te Makuranga is another large work, this time about two metres wide rather than high. Here the alternating figures and spirits pose like a line-up in front of the olive-green animal curves of the hills. look like patterns of concentrated energy that cannot be defined more clearly because they would then lose their value." "The unpretentious but very fine exhibition by Sarah McBeath at the French Art Shop Gallery in Ponsonby Road succeeds in incorporating Maori thinking and motifs. Almost all the paintings are Northland landscapes. Some are directly painted and for all their small size are full of atmosphere. They are little gems. There is a second category of more profound work where the ancestral spirits that inhabit the land are made manifest in figures based on Maori carving. Most of the work uses dark ridges with the light beyond. In Tuia I te Here Tangata there is a linked chain of motifs under the hills that very effectively suggests a continuum of thought and feeling associated with the land. The skill and thought evident in these works is complemented by some works shaped like banners which involve a mask-like face framed by the unfolding spirals of fern fronds. 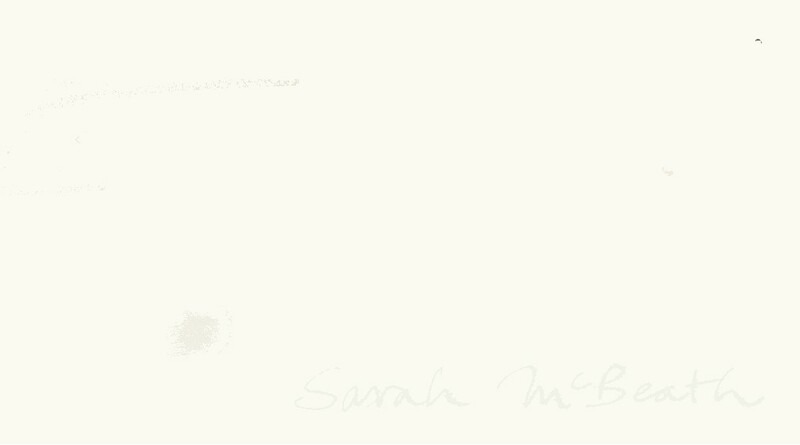 With this exhibition Sarah McBeath becomes a force to be reckoned with in New Zealand art." "Sarah McBeaths Te Ao Marama and her Waimauku are fine landscapes playing on the movement of light as it travels across the land from its source within the sky. They display good background fading effects. Perhaps signaling a new maturity in her works." "Sarah McBeaths volcanic landscapes are aptly Northland but her stand out are the Tukutuku panels. An influence of McCahon is apparent in the panels."